Reacts with both AP-2 alpha and beta forms. As the antibody also recognises AP2 beta, the epitope it recognises is probably the last 8 amino acids as these are common between alpha and beta. C-terminal peptide of AP-2 alpha (PNSHTDNNAKSSDKEEKHRK). Our Abpromise guarantee covers the use of ab61 in the following tested applications. WB Use at an assay dependent concentration. Predicted molecular weight: 48 kDa. IHC-P Use at an assay dependent concentration. Perform heat mediated antigen retrieval via the microwave method before commencing with IHC staining protocol. ICC/IF image of ab61 stained HeLa cells. The cells were 4% PFA fixed (10 min) and then incubated in 1%BSA / 10% normal Goat serum / 0.3M glycine in 0.1% PBS-Tween for 1h to permeabilise the cells and block non-specific protein-protein interactions. The cells were then incubated with the antibody (ab61, 1µg/ml) overnight at +4°C. 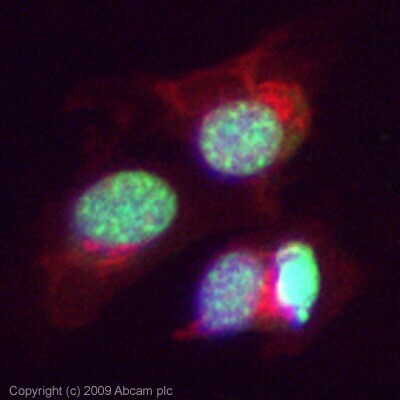 The secondary antibody (green) was Alexa Fluor® 488 Goat anti-Mouse IgG (H+L) used at a 1/1000 dilution for 1h. Alexa Fluor® 594 WGA was used to label plasma membranes (red) at a 1/200 dilution for 1h. DAPI was used to stain the cell nuclei (blue) at a concentration of 1.43µM. Publishing research using ab61? Please let us know so that we can cite the reference in this datasheet. Do you have a recommendation for a positive control tissue for this antibody? Thank you for your enquiry. Raji cells or breast carcinomas should be a suitable positive control. I hope this information helps. Please do not hesitate to contact us if you need anything further. Do you know the exact amino acid sequence of the immunogen? Do you know the recommended dilutions for western analysis? We always recommend that conditions for WB should be optimised by the end user. We suggest starting with a 1:1000 dilution. This antibody recognises the transcription factor AP-2 and thus not the adaptor protein (AP-2). Does this work in gel shift (EMSA) assays?? We don't have any information on this antibody being used in EMSA, but as the immunogen was a C-terminal peptide chances are quite high it will work. My name is Estibaliz Lopez and I am a Ph.D. student at Uppsala University in Sweden. I would like to know if this AP-2 antibody will be useful for whole mount immunohistochemistry. We fix our mouse embryos in 4% paraformaldehyde overnight. Have you try this before?. If so, does it work?. Thanks for your attention. Estibaliz. This antibody works in immunohistochemistry with paraffin embedded sections (fixative formal saline with calcium, 10 min microwave treatment required). However it has not been tested for whole mount IHC as you describe.